The 1938 Flathead Harley Davidson UL Chopper for Sale has an early model 4 speed transmission rebuilt with all Andrews gears. It has been punched out to 80 cubic inches and has a late model Harley rear disc brake, a late model factory Harley springer with Harley disc brake, a brand-new Kraft Tech rigid motorcycle frame, 21 inch front and rear rims with new Metzler tires and a 12 volt electrical system with a Cycle Electric generator. The old Harley's gas tank and fenders have been beautifully wrapped in quality leather and it has many, many more custom parts and accessories used in the most tasteful of applications. This antique has only been on the road only 92 miles since it was rebuilt and has had over $5000 invested in parts in the motor alone. 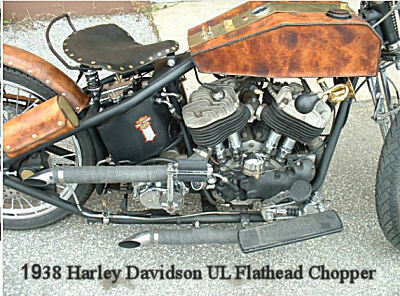 If you would like to write a review or voice any opinions on the Harley UL Flathead for sale, you may use the comments form below this ad to do so. Thanks for visiting GoGoCycles Used Motorcycles for Sale and for taking a look at my 1938 Flathead Harley Davidson UL Chopper . My location is in the vicinity of Finksburg/ Baltimore Maryland MD and in my opinion my asking price of $13,500 for the custom chopper is cheap enough that it will be difficult to beat on Craigslist or in an Ebay auction. If you want to take a look or have questions call me, Glenn, (NO EMAILS) at 4four3-472-7088 for more details and don't forget to mention that you found this ad on Strike Lightning's Used Motorcycles and Parts for Sale www.gogocycles.com.